Light is one of life’s necessities. We would not be on this planet if there was no light. When there is no natural light, we need artificial. And that’s how it is from the beginning. Some 400,000 BC Homo erectus finds fire, most likely by accident when a lightning hit a tree or a bush. Human development was born from that accident. 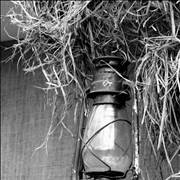 First portable light was a torch - a branch or a bundle of sticks tied together with one end doused in a flammable liquid and lit. Around 70,000 first primitive oil lamps appeared. They were made from hollow stones or shells that were filled with moss soaked with animal fat. In ancient Greece they were first made from clay on a pottery wheel and then in moulds which gave better quality and enabled mass production. 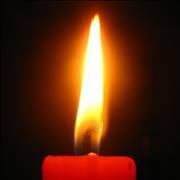 First candles were made in China in 200 BC from whale fat with rice paper wick. Through time they were made from other materials too, like tallow, spermaceti, colza oil and beeswax until the discovery of paraffin wax which made production of candles cheap and candles affordable to everyone. Wick was also improved over time and made from paper, cotton, hemp and flax with different times and ways of burning. Early history of lightning is marked with simple and primitive but ingenious solutions that early and ancient men used to fight against the darkness. 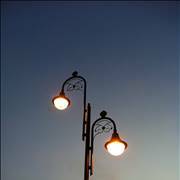 Read more about lighting history. With advent of electric current begins an era of the fastest progress in human history. Problems that looked unsolvable were now looked at from the new angles. With them were problems of public lightning. Learn about electric lightning here. Oil lamps stayed pretty much the same until the 18th century and the man called Aime Argand. He was Swiss chemist and he made an “Argand lamp” which was improved variant of an oil lamp. 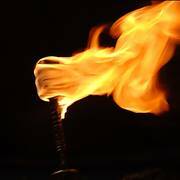 It had cylindrical wick that gave larger flame and with that more light, it had an opening on the bottom that fed the flame with fresh oxygen and a cylindrical glass chimney that directed the draft from bellow and protected surroundings from the flame. In 1846, doctor and geologist Abraham Gesner distilled kerosene from coal and found that it is flammable and that it burns with much brighter light than oil. First kerosene lamps were independently made by Ignacy Łukasiewicz of Poland and Edwin Dietz of USA in 1853. 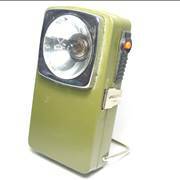 They were designed to have container for kerosene, flat or a tubular wick or mantle and a glass chimney. 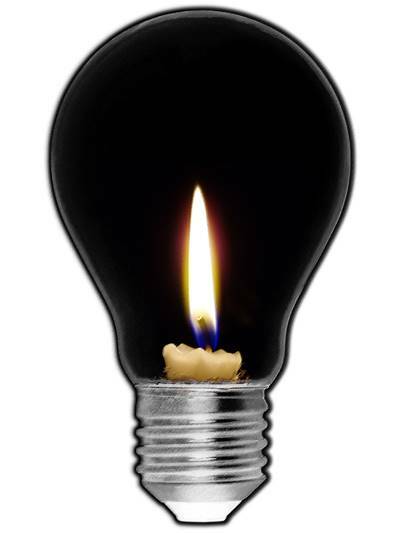 After centuries of different but not too effective solutions for public illumination in 1792, inventor William Murdoch used gas distilled from the coal to illuminate his house. 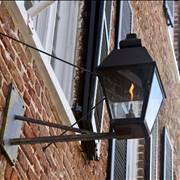 In 1807, London got a first street illuminated with gas lanterns. 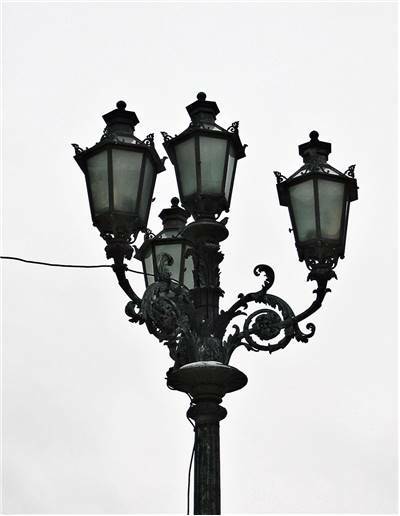 Gas lanterns were placed on the posts and lit and extinguished by hand every evening and morning. After that other cities of the world followed. Until electricity came. At the beginning of 19th century, Sir Humphry Davy set foundations for electrical lightning. He performed an experiment with a battery and a platinum strip, which made a connected strip glow. 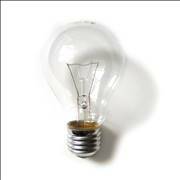 That was the beginning of an incandescent light lamp. 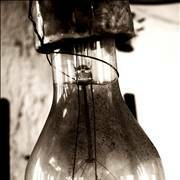 After him, many inventors tried to improve incandescent light bulb until Sir Joseph Swann and Tomas Edison did succeed with a better vacuum and a carbon filament. After that, electric lightning spread the world and is still here today in the same and in improved forms.